Study by PwC and Goethe University Frankfurt reveals: In Dax and MDax-listed companies, bonuses are decoupled from corporate success after payout. To date, the bonuses paid out to executive board members in Germany have not been sufficiently linked to long-term corporate success. 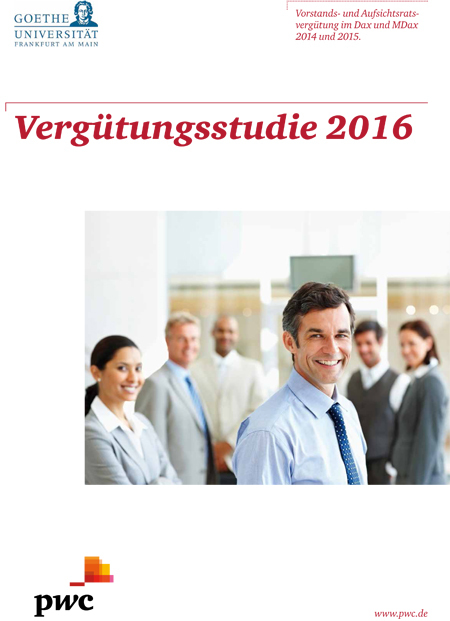 This is the conclusion reached in the new “Remuneration Report” by consultants PwC in cooperation with Goethe University Frankfurt. Whilst about 60 percent of overall remuneration for Dax and MDax board members is indeed made up of performance-related payments – of which in turn more than half are long-term – most of these payments, which are known as Long Term Incentives (LTIs), are in cash rather than based on share plans. That means: Bonuses are automatically decoupled from business development the moment they are paid out. “When compared at international level, Germany can thus be classed as a special case. In our view, it would be more advantageous if long-term bonuses were awarded in the shape of shares in the respective company and the board members were also bound by means of corresponding clauses actually to keep these securities for a longer period of time, if necessary even beyond their term of office. This would ensure that it is in board members’ vested interest really to work towards the company’s long-term success”, says Remo Schmid, co-author of the report and partner at PwC in Germany responsible for remuneration issues. For the report, PwC and Goethe University Frankfurt examined remuneration structures in Dax and MDax companies. The analysis shows that developments in executive board remuneration in 2015 differed in comparison to the previous year: On average, a Dax CEO earned € 5.6 million, a plus of a good 3 percent. Other board members earned € 2.9 million, which equates to a minus of 2 percent. CEOs in MDax companies earned € 2.5 million on average, whilst their board colleagues were paid € 1.3 million. In other words: On the Dax, the barometer for blue chip companies, top managers are paid more than twice as much as their counterparts in medium-sized enterprises on the MDax. What’s more: The average CEO earns on average almost double the salary of a “normal” board member. According to the analysis, the percentage of women amongst top-level executives is rising at an astoundingly slow pace. At the end of 2015, a good 91 percent of all board positions in Dax companies were still occupied by men – whilst in MDax firms it was even 96 percent. The picture is far better, though still not good, in regulatory bodies: In Dax companies, 26 percent of all supervisory board members were female compared to 18 percent in MDax firms. “In many enterprises, cultural change in this respect would be highly desirable”, says Professor Dr. Hans-Joachim Böcking, co-author of the report and professor at Goethe University Frankfurt. Still: “At least as far as the basic salary of executive and supervisory board members is concerned, no gender-specific differences were detected either in Dax or MDax companies”, says Böcking. A chairman on the supervisory board of a Dax company received an average total remuneration in 2015 of €böcking 311,000. Deputies earned € 230,000, other supervisory board members € 127,500. Pay scales in MDax firms were far lower. Here companies considered their main overseer to be worth an average of € 183,500, the deputy was paid € 121,500 and the other members received € 75,000. Worth noting: Whilst the fixed remuneration for supervisory board members increased on average by about 12 percent in Dax and MDax companies, variable remuneration is still on the decline: in 2014, four out of ten Dax companies still made some form of variable payment. In 2015 it was only three out of ten. In PwC’s view, its task is to build trust in society and solve important problems. 223.468 employees in 157 countries contribute to these goals by providing high-quality, sector-specific auditing, tax and corporate consulting services. The PwC brand name refers to the PwC network and/or one or several of the legally independent member firms. For further Information please see: www.pwc.com/structure.